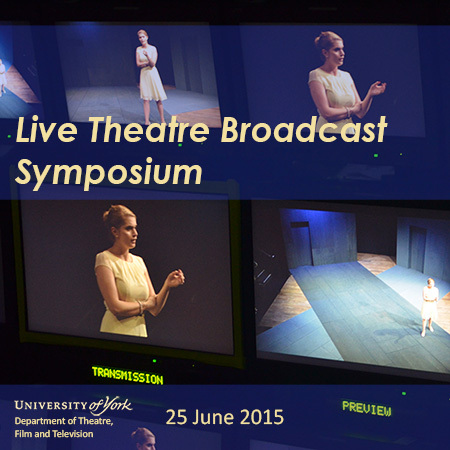 In recent years, live-streamed theatre broadcasts have emerged as a significant cultural phenomenon, aiding public access to – and representing a new practice for – key international, national and regional institutions, such as the National Theatre, the Royal Shakespeare Company, Pilot Theatre, Forced Entertainment, and cinema distributors around the world. How do such broadcasts change the experience of live events, and how do they alter the spectrum of media through which performances occur? This emerging hybrid medium introduces challenges for practitioners, critics and institutions for the creation, reception and funding of live theatre and events, yet suitable approaches to frame academic discussion of it are underdeveloped. The impact of these innovations on industry; including on actor training, the funding of regional theatres, media companies, and cinemas, or the relationships between cultural institutions and their audience. How live broadcasts may have altered directing and performances: have they worked further to reinforce the dominance of ‘televisual naturalism’ in acting and design? Have they altered the use of space, particularly in larger auditoria? How relationships between the creative teams of the production and of the broadcast function: what is the relationship between the shaping of scenes by a director and their editing for broadcast, and between all aspects of design for the theatre and for broadcast? The lessons we could learn about live mediated performance from television history. What are the premises of intermediality in live theatre broadcast in terms of how different media are combined, amalgamated and co-related within performance and cultural discourse, and as practices across media? How may these be more widely related to the production processes, technologies and outputs of cultural production? How cinema spaces are adapted for theatre broadcasts, and the effects on audience behaviour and experience. How interactive media such as mobile apps, web installations, games and social media alter the theatre experience, and how they may be employed most effectively in terms of audience outreach and engagement. Abstracts of up to 250 words should be sent to the project administrator, Mark France (mapf500@york.ac.uk) by May 28 2015.